Share the post "Pony Tales"
It was quite the busy Friday to where I dare say there wasn’t much of a downtime for me while at my office. Between scheduled appointments, phone calls and random walk-ins, I’d say buyer activity is finally picking up, and likely due to our temperatures rising. There are two separate offers I’ve been working on, and it looks like one of them is a go, but the other one is still hovering in an iffy state. The one that did come together was listed by another agency, and the agent handling it, was once again exceptionally easy to work with. Each time we’ve worked together, it’s always been a smooth transaction. It would be great if a handful of other agents would take lessons from her. My closing at 903 – 12th St. NW went exceptionally well, and when I got back to the office, I placed a call to the owner telling her the proceeds check just got delivered to the Post Office. While visiting with her the other day, she reminded me about the time we first met some years ago, and sharing how from the first time she talked to me, she had a very good feeling about me. I was humbled by those words, but also went on to thank her for being such a kind and caring person herself. The number of times we visited during the listing period, she was always upbeat and light-hearted. I told her today that I wish there’d be a way to clone her and begin filling in the blanks of all great people that’ve either moved or passed away here in North Iowa. She laughed and said, “When the technology is there, I give you permission.” For some reason, I have a feeling she’ll continue to stay in touch with me. There were a number of heartfelt stories she shared with me that I’ll remember for years to come. I’m pretty much ready for both of my public open houses this weekend, and remaining hopeful the weather will be pleasant both days. The first one is tomorrow which is located at 24 – 11th St. NE. Without a doubt, if there should be a large family looking for extra room, that home has it. I heard some years ago that it was built for the owners of a N. Federal drug store, but I’m not sure which one it was, and by the looks of the home’s quality, I’d say they had a booming business. It happens to be located in the Oak Park district which has always been my favorite over these long years. Most of those homes were built by up-and-coming families who insisted on having quality residences constructed with all the extras so to show off their rising status in our community. Without counting, I’d say over these past decades, I’ve sold at least two-thirds of the homes in that entire district. For years, I used to say I had some sort of cosmic tie to that neighborhood. Not too many years ago, an elderly widow living down the street called and asked if I would stop by for a visit. When I walked in, the first thing she said was, “Since you’ve sold nearly every home up and down this street, it looks like you’re finally going to get an opportunity to sell mine.” Believe it or not, I think we had it sold in about two weeks. I’m always quick to point out that there are at least five or six City employees living in those blocks, and one of them happens to be the captain of our police department. How much more safe can you get? I bristle every time someone refers to that district as “the hood” because it’s definitely not. No matter what anyone tells you, for the money, that neighborhood is about as rock solid as you can get. I’m so glad I finally got 21 – 11th St. sold over the winter, and I know for a fact, the new buyers have already spent thousands of dollars on the interior, and hopefully they’ll now be working on the exterior since it’s getting warmer outside. I speak of this home because it’s almost directly across the street from the one I’m having open, so you can be sure I’ll mention its transformation to every buyer that walks thru the door tomorrow afternoon. I’ll be hitting the road early in the morn due to an appointment I have up in Winnebago County which means I’ll be placing my open house signs out all the earlier. I’ve already planned for the time driving up and back, as well as giving myself an estimate of time I’ll be spending with those residents because I certainly don’t want to be racing to make my later appointments. The above photo is yet another one out of my “box” which I thought worthy of sharing. It certainly made me smile when seeing that little boy on top of that Shetland pony. 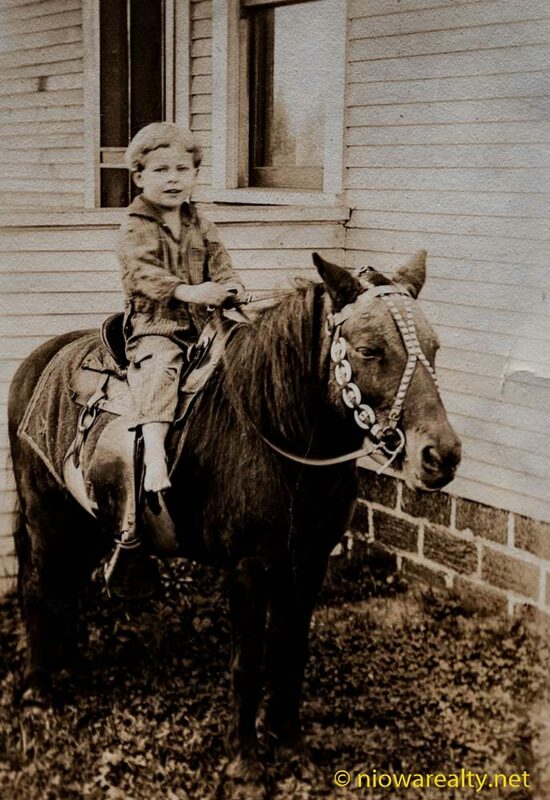 Since I personally had horses when I was growing up, many fond memories began rushing back. I’m sure after that tyke reached adulthood, he had many pony tales to tell. So cute! Tonight’s one-liner is: If you spend all day on horseback, and you hop off, you walk around like you still have a horse between your legs.